Sometimes the crimes are caused by too much alcohol or festering family tensions but often as not they are simply acts of evil whose timing is a complete coincidence. In 1987 the Christmas holidays became a scene of carnage for one unfortunate family in Dover, Arkansas. Retired Air Force Sergeant Ronald Gene Simmons was overcome by an evil rage and decided to slaughter his entire family. "You have destroyed me, and you have destroyed my trust in you… I will see you in Hell," he wrote in a letter to one of his daughters, who had had the temerity to report him for sexually molesting him. Between December 22 and 26 he methodically killed his wife, six daughters, three sons, two grandsons, a son-in-law, a daughter-in-law. They were either shot or strangled. On December 28 — after spending two days happily watching television and drinking beer at his home, surrounded by the dead bodies of his family — he went into the nearby town and shot dead a 24-year-old woman, Kathy Kendrick, 24, and his former workmate J.D. Chaffin, 33. Simmons was eventually arrested and in June 1990 he was executed by lethal injection — the death warrant being signed by the Governor of Arkansas, future President Bill Clinton. On Christmas Eve 1990 businessman Malcolm Kennedy, 44, went out to celebrate and got a bit drunk. He ended up being arrested for being drunk and disorderly and was locked up in a cell at Hammersmith police station with an Irish labourer, Patrick Quinn, 56. When he woke up in the morning Quinn was dead. Kennedy was charged with murder and was jailed for life in September 1991 but he protested his innocence, claiming Quinn was actually beaten up by police officers. He persuaded the Court of Appeal to quash the verdict and order a retrial. This time he was convicted of manslaughter and sentenced to nine years. In 1994 an Early Day Motion in Parliament claimed Kennedy had been "failed by the criminal justice system" — it was tabled by a backbench MP — Jeremy Corbyn. Kennedy was freed in 1996 but maintained his innocence right up until his death in 2013 and told anyone who would listen that the real killers were in uniform. At the time of his death Kennedy was attempting to find out from the Metropolitan Police what information an undercover police officer who had infiltrated the campaign to clear his name had passed onto his handlers. On New Year's Eve 2009 Shele Danishefsky Covlin, a 47-year-old New York finance executive, was drowned in a bathtub at her home on the affluent Upper West Side in Manhattan. Her estranged husband Roderick Covlin, 42, was strongly suspected but was only charged with murder in 2015. Covlin, a backgammon expert who is also accused of plotting to kill his own parents after they were given custody of his two children, still has not come trial. In the early hours of January 1, 1989 Christiane Remacle, 19, was raped and strangled with one of her own stockings as she headed home from a New Year's Eve party in Belgium. Frank Van Den Bleeken was arrested but was later deemed insane and therefore not criminally responsible. In 2015 he hit the headlines when he was cleared for euthanasia while in jail. But the euthanasia plan was turned down and remains alive in prison. Three days after Christiane was killed another teenager on the other side of the world fell victim to an even more horrific crime. Junko Furuta, a 17-year-old high school student, had been abducted as she cycled home from a part-time job in November 1988 and was kept for 44 days by Hiroshi Miyano, 18, and his friends, Jo Ogura, 17, Shinji Minato, 16, and Yasushi Watanabe, 17. During that time she was tortured and raped around 400 times at a house owned by Minato's parents before finally being killed on January 4, 1989 — reportedly after beating one of the boys in a game of Mahjong. Her body was found encased in concrete in a 55 gallon drum in March 1989. Miyano — whose family had links with the Japanese mafia, the Yakuza — was the ringleader and was convicted in 1990 and jailed for 17 years. He appealed but was then given an extra three years in jail. The other three were each sentenced to between three and nine years in prison. The judge at their trial said Junko had been treated so brutally her "soul must be wandering in torment" but the sentences were widely seen as being too lenient. The case has spawned numerous books, songs and films in Japan. On New Year's Eve 1975 Mark Rowntree, a 19-year-old former public schoolboy, stabbed Grace Adamson, 85, to death at her home in Bradford, West Yorkshire. She was a complete stranger to him — as were the three other people he killed over the space of seven days. On January 3, 1976 Rowntree attacked Stephen Wilton, 26, at a bus stop in nearby Keighley and four days later he murdered prostitute Barbara Booth, 24, and her son Alan, three, at her home in Leeds. Later that year Rowntree was convicted of manslaughter on the grounds of diminished responsibility and was detained indefinitely in Rampton Hospital, a secure facility for the dangerously mentally ill. He was later transferred to St Luke's Hospital in Middlesbrough where he remains. His file, at the National Archives, will remain secret until 2058. On December 28, 1977 a parcel arrived at the home of Professor Edwin Grech, the head of the department of obstetrics and gynaecology at St Luke's Hospital in Malta. It exploded when his 15-year-old daughter Karin picked it up. She was killed instantly. At that time the doctors at Saint Luke's Hospital were on strike because of a dispute with the Maltese government, led by Dom Mintoff, a colossal figure in the island's political history. Dr. Grech had ignored the strike call and gone to work. Another letter bomb was sent to Paul Caruana, a doctor and also a Labour MP, on the same day but it did not explode. Suspicion on a group of doctors who were close to the opposition Nationalist Party but the case remains unsolved but was mentioned recently after the assassination of Maltese journalist Daphne Caruana Galizia last year. 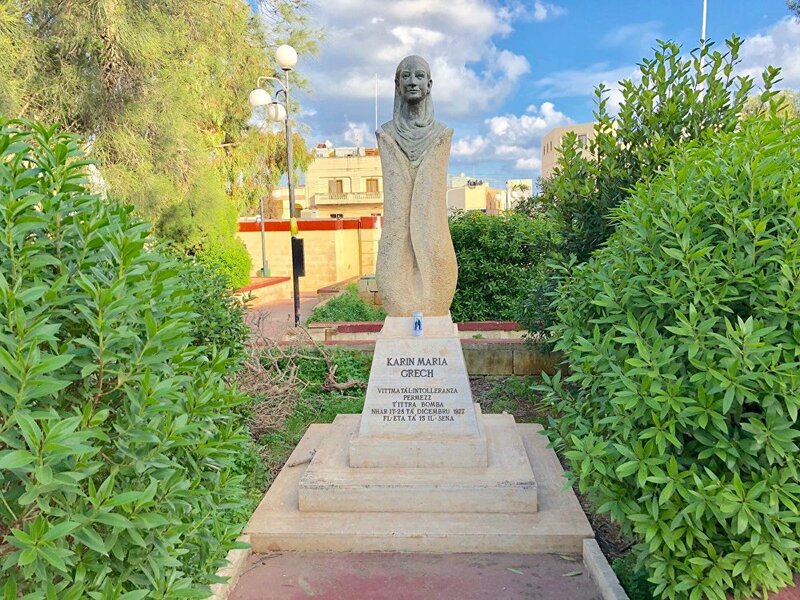 Fittingly a hospital on the island was named after Karin Grech. On New Year's Day 1985 police were called to a house in one of the most luxurious parts of London where the body of 40-year-old Aristos Constantinou lay in a pool of blood. The Greek Cypriot fashion tycoon had been shot six times at close range at the seven-bedroom house in Bishop's Avenue, Edgware moments after returning home from a New Year's Eve party with his wife Elena, who was only 26 at the time. The father-of-three had been killed with nickel-plated bullets from an Italian-made Fiocchi gun, which had gone out of production in 1961, which led to it being known as the "Silver Bullet" case. Elena claimed she had been confronted by burglars and was locked in a bathroom. Glass had been smashed in the back door and £50,000 was missing from a safe, which seemed to confirm the burglary theory. At the inquest in 1986 Elena dramatically identified the burglar who had grabbed her as the father of a young man who she was having an affair with at the time. During a second police investigation in the 1990s, they found there had been an acrimonious dispute between members of Aristos' family. In 2008 the then Director of Public Prosecutions, Keir Starmer — now the Shadow Brexit Minister — refused to sanction the prosecution of a suspect despite the urging of the dead man's brother Achilleas.